A journalism trainer whose students included Sky Sports presenter Jim White and ITV’s Lorraine Kelly has died aged 85. Tributes have been paid to Bill Allsopp, left, who taught journalism and media studies at Edinburgh Napier College after a career which took him across the country. Starting out as a copy boy at the Daily Mail aged 16, he became a cub reporter in Dingwall and then had a stint in Newtonards, Northern Ireland. Bill then moved to the Essex Chronicle, where he met his wife Elizabeth, before becoming chief reporter with the Oban Times and later taking a feature writer job at the Scottish Daily Express in Glasgow. 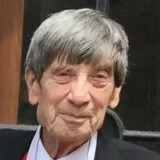 After the Express closed its Glasgow office in 1975, Bill worked for a short time as the Scottish correspondent at the Sunday Times, before being approached by Napier to teach its new journalism course. In an obituary for The Scotsman, his grandson Rory Hill said: “He loved his job, likewise his students, and they loved him right back. Lorraine Kelly told The Scotsman: “I used to hear his voice in my head whenever I was writing a story and that continues to this day. Bill died in August, but his obituary was carried by The Scotsman earlier this month.